The calendar maker has attempted to get to grips with these problems in varying ways.  The Sumerian, Babylonian, Middle Easterners, Arabians, Muslims and Jews kept to the lunar calendar with the result of having completely different lengths of the year, which lay between 353 and 385 days  an impractical and problematical business. The consequences of the lunar year are that the calendrical beginning of spring, the 21st March, which is so important to agriculture, no longer coincides with the actual start of spring.  The Greeks had a different calendar for each province.  The Indians still had over 30 different calendars in 1953.  The Chinese used a very perfect, for us however risky calendar regulation.  The Mayas possessed the most precise and most original solar calendar. The illustration on the right represents the calendar wheel of the Mayan "longcount". 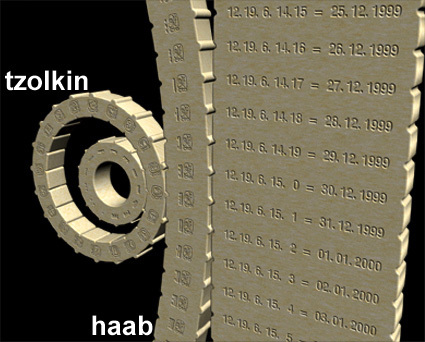  civilian calendar "haab" with 19x20+5=365,242198 days. Corresponding to a deviation of 7 seconds per year!